Watch me make these creamy, Southern Stone-Ground Grits from start to finish! I don’t know of many recipes that are as southern as grits. 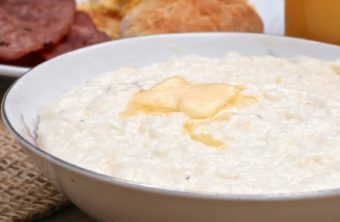 Grits are a true Southern classic that I grew up eating for breakfast just about every weekend! They also made their way to the dinner table in the form of savory cheese grits cooked in milk and chicken broth served with fried fish. Sooooo good! Have you ever had grits before? It seems that folks either love or hate them. If you hate them then chances are you just haven’t had them fixed right. And by fixed right, I mean simmered in milk with plenty of butter, salt, and pepper! 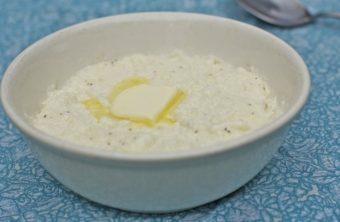 Grits served plain and boiled in water is just downright disgusting! Bless your heart if that’s the way you were introduced to them. Grits are on the same comfort level as mashed potatoes and macaroni and cheese in my book. They just have a way of making things seem good with the world. Now some Southerners will gasp at the thought of 5-minute or instant grits because they feel stone ground grits are the only true way to fix grits. Meh, I can get down with the 5-minute grits if they’re made a certain way, but I can’t deal with the instant packet grits. I’ve tried. I have to admit though, stone-ground grits sure hold a special place in my heart. They get ridiculously creamy and just have a certain spirit about them. Stone-ground grits are made from corn just like any other grits, only a much coarser ground. It’s done the old-fashioned way, using the entire kernel. Anytime I can get my hands on some hand-milled stone-ground grits I go for it. Every bag of stone-ground grits are different, which I think just adds to the charm. I’ve had some bags that take much longer to cook and some that cooked really quick. Some that had a strong corn taste and some that were very mild. 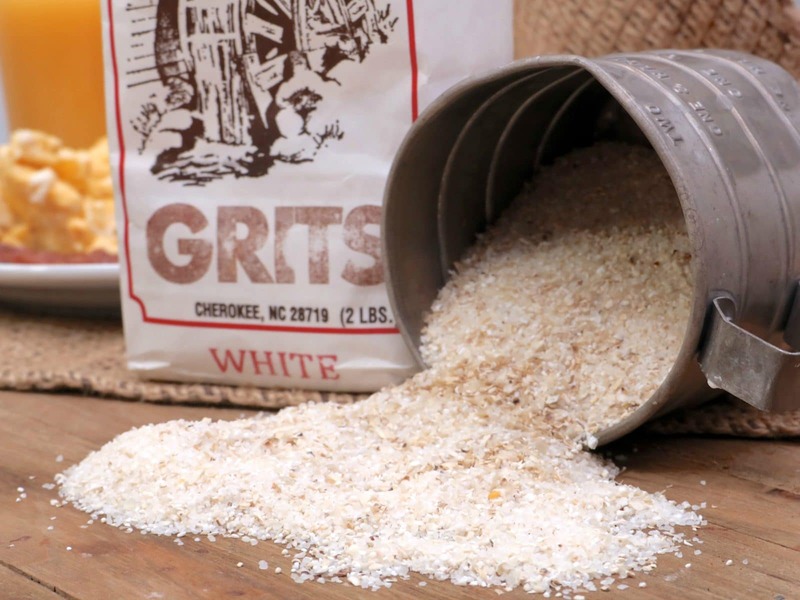 The grits you see in grocery stores are usually quick or instant grits. I go to the Farmers Market for my stone-ground grits because I can never seem to find them anywhere else. Sometimes Earth Fare will have them. Sure, stone-ground grits take a bit longer to prepare (anywhere from 20-60 minutes, depending on the kind) but they are the creamiest grits ever. You may find it hard to go back to instant grits after that first, creamy, buttery spoonful. Today I’m going to show you how to make a really good (and simple) pot of Southern stone-ground grits. I’m keeping this recipe super simple and classic! No fancy spices just butter, salt & pepper! When making grits, whether quick or stone ground, forget what you read on the back of the package (most of the time). I never prepare them this way. Follow along with the steps below and you’ll have a pot of truly, authentic and delicious Southern grits. 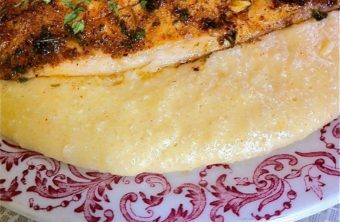 Here are a few tips that will give you the best Southern stone-ground grits ever! 1. Remove the chaff. Cover the grits in water first, stir them around and remove the chaff that floats to the top. Not unless you don’t mind those hard, crunchy bits in your grits. Use a mesh strainer or just pour off the water and repeat until no more hulls float to the top. 2. Whisk. Whisk. Whisk. Whisking the grits into the boiling milk/water prevents them from getting clumpy. The last thing you want are those infamous grit balls! Smooth and creamy is the goal. You’ll also want to make sure that you are whisking it often during the cooking time as well. It’s totally ok to get OCD here! Grits loved to be whisked. 4. Add butter, salt, and pepper. This is MANDATORY! Grits are kinda bland in their natural state. Butter, salt, and pepper wakes them up and bring out that wonderful light corn flavor. 5. Don’t cook them in just water. I know a lot of people do this because they like for the full corn flavor to shine through. Boo. To me, milk just adds more flavor. I mean have you ever had corn on the cob boiled in milk?? THE BOMB! Grits simmered in milk is no different. Milk adds so much creaminess and depth. I will NEVER go back to cooking my grits in just water not unless I absolutely have too. I always simmer mine in half n half, milk, heavy cream, or broth. Sometimes a combination! 7. Do serve grits with side dishes. Grits eaten alone with no side dishes is just …..sad looking and you’ll probably feel a bit sad eating it that way. Give it friends like scrambled/fried eggs, bacon/sausage, buttermilk biscuits/jelly toast, hashbrowns/fried skillet potatoes, and country fried apples/fresh melons. Yep, now that’s a Southern-style breakfast fix for the King/Queen that you are! And don’t forget the orange juice. Homemade if possible but Simply has never let me down. Place grits in a large bowl and cover with water. Stir and allow the chaff to float to the top. Use a mesh strainer to remove and discard the chaff. Drain off the water. Set aside. Gradually add grits into the pot, whisking constantly. Let boil for two minutes, whisking constantly. If grits are too thick, stir in more half n half or water. 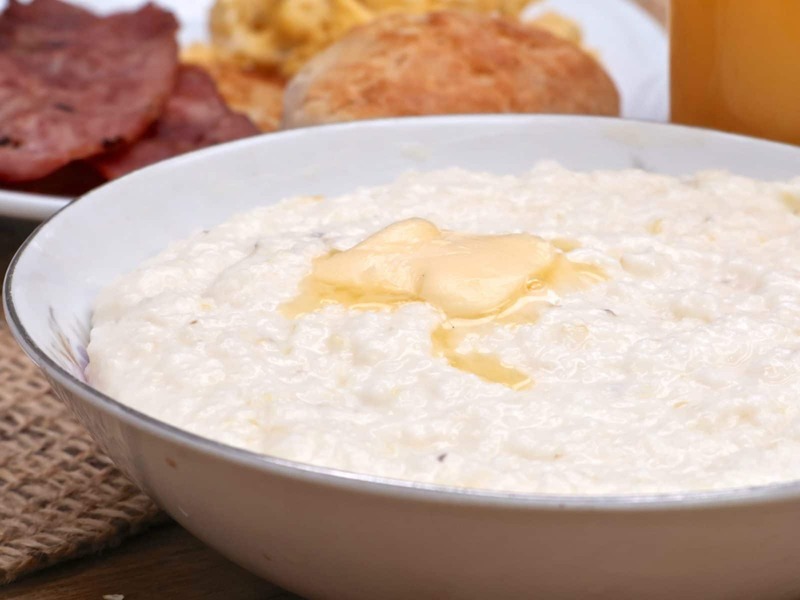 If grits are too thin let them cook uncovered until thickened or remove from heat and allow to thicken. When grits are done, taste and adjust salt and pepper if needed or add in more butter. Stone-Ground grits are very unique and can vary greatly from brands. Some can take 20-60 minutes to fully cook. OH MY I LOVE YOUR BEAUTIFUL BOWL !! Well now after watching you prepare those grits, I’m going to try them.. they look like something I would love. thanks for the video — they really help !